The Bob Cole Conservatory at California State University, Long Beach, has a lot to offer! Our ensembles are recognized as some of the finest in the west, even in the nation—Pacific Standard Time and Concert Jazz Orchestra have both repeatedly won Downbeat Magazine’s "Best Collegiate Jazz Ensemble." Our Bob Cole Chamber Choir has won the prestigious "Choir of the World" award in Wales this year. Our symphony orchestra has toured in Korea and was invited to Germany this year. Our bands have recently travelled to Korea and Japan. Check out our YouTube channel and hear for yourself. We have an exuberant, dedicated faculty who are on campus to help you become an excellent, well-rounded, professionally-prepared musician and scholar. The University Symphony Orchestra plays Duruflé’s Requiem. Johannes Müller Stosch conducting. Our alumni are a testament to our mission of student success. Recently, a choral conducting student won a Fulbright and just finished a second Master’s degree in London, our vocalists have sung at the San Francisco Opera and at the Met (and with many regional operas), and have toured in official Broadway companies. Our jazz alumni tour the world with Jennifer Lopez and Natalie Cole, have been lauded on NPR, and many have released highly acclaimed recordings with their fellow alumni. Our musicology and composition students are in graduate programs from Harvard to UT Austin with significant fellowships and TA positions. Our alumni have positions in major and regional orchestras, in chamber groups, and they perform on Hollywood recording sessions. Music Education graduates teach in some of the top K-12 programs in the Southland. Our alumni also become attorneys, medical doctors, orchestra managers, sound engineers, instrument repairmen, film and video game composers, and work at the top level of music publishing firms. Take a tour of our website to hear from Area Directors, see videos of some of our performances, read about our faculty, and check our daily blog; begin to form a picture of how much you can gain from attending the Bob Cole Conservatory. While we do have a graduate program, we are an undergraduate-focused conservatory. This fall, some Freshmen auditioned into the Wind Symphony and were on a tour to South Korea in their third week of school. If you want to follow our student, faculty, staff, and alumni accomplishments, please send Dr. Johannes Müller Stosch an email. We can add you to our "Weekly Update" email which comes out on Monday mornings. You can send an email to be removed from the list at any time and we’ll automatically stop sending them at the end of this school year in May. Downtown Long Beach with the Queen Mary at sunset. Long Beach feels like a small town in a huge metropolis. There are opportunities to hear the finest professional musicians every night in LA and Orange County with the LA Philharmonic, Pacific Symphony, LA Chamber Orchestra, LA Master Chorale, and LA Opera 30 minutes away; the innovative Long Beach Opera is in our own backyard, many major new music ensembles make LA their home, and dozens of top jazz clubs are nearby. We are close to world-class libraries and museums, and of course, the Pacific Ocean is our next-door neighbor. We are pleased that you are interested in the Bob Cole Conservatory of Music at California State University, Long Beach. Feel free to call us at 562-985-4781 if you have any questions. The following steps will guide you through the undergraduate admissions process. Undergraduate and Transfer students can additionally review information using the appropriate links on the right. 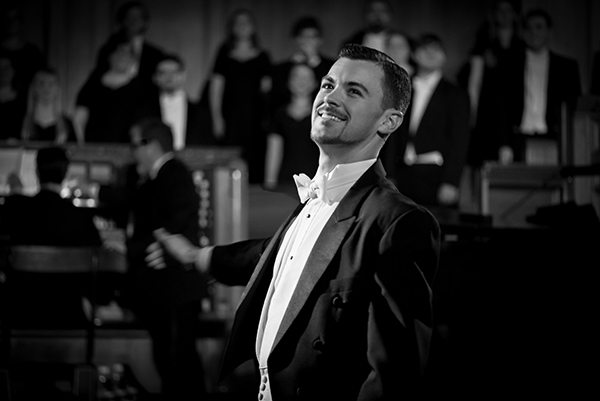 Stephen Salts, MM Choral Conducting and 2014-15 Fulbright Scholar, England. If you live outside of the Los Angeles area, a tape or video audition may be acceptable. To discuss an audition by tape or video, or to schedule an alternate date for an on-campus audition, please contact the appropriate Area Director. We provide accompanists for vocalists, brass, and woodwinds; please bring the accompaniment music with you. You may provide your own accompanist if you wish. It is preferred that strings audition without an accompanist. New student auditions also serve as scholarship auditions. Scholarships of up to full tuition are available for outstanding musicians. For more information visit the Scholarships Page.